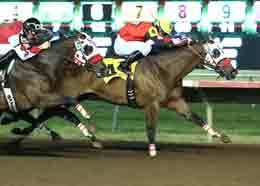 Eyesa Wagon Maker, under jockey Stormy Smith, wins the Mystic Lake Northlands Futurity at Canterbury Park Friday night. SHAKOPEE, MN �JULY 6, 2013�Trainer Stacy Charette-Hill had four of the nine starters in Friday�s $133,525 Mystic Lake Northlands Futurity at Canterbury Park and finished first , second, third, and fifth in the richest quarter horse race in the Shakopee, MN track�s 27-season history. Eyesa Wagon Maker, who paid $75.80 to win, prevailed by a neck over Mighty Coronas First. Little Pyc was third and wagering favorite High Ace finished fifth. Final time for the 350-yard race was 17.763 seconds. Stormy Smith, who won this race in 2011 and 2012, was aboard Eyesa Wagon Maker. �The five horse (Little Pyc) was leaning on us just a little and when Omar (Reyes) went to the stick he moved out and my horse took off,�� said Smith. The 2-year-old PYC PAINT YOUR WAGONgelding is owned by the trainer and her husband Randy L. Hill. He is out Eyesa Candy Maker, by Eyesa Special. Third place finsiher Little PYC, by PYC PAINT YOUR WAGON, races for owner/breeder Buddy Albin. He is out of the First To Flash mare Mini Melt. Ridden by Oscar Reyes the colt earned $13,352 for the effort. Fourth place went to Fantastic Follies, by PYC PAINT YOUR WAGON handled by Randy Smith, and is out of Fantastic Six, a mare once raced by the husband and wife team.